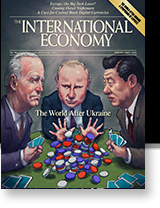 The magazine of international economic policy. Why Is Populism On the Rise and What Do the Populists Want? What problems are today’s populists seeking to address? Are followers of populist leaders driven by economic insecurity at a time of rising economic inequality and subpar growth, or by a reaction against progressive values, or both? How to escape today’s populist dilemma. Should the Federal Reserve reexamine its communications policy? And should the Fed’s dual mandate be reexamined? More than a dozen noted experts share their thoughts. Featuring commentary from Hannes Androsch, Scott K.H. Bessent, Lorenzo Bini Smaghi, Mario I. Blejer, Charles W. Calomiris, William B. English, Richard D. Erb, James E. Glassman, Gregory D. Hess, Richard Jerram, Mickey D. Levy, Marc Sumerlin, and William R. White. As its twentieth anniversary approaches, was the currency fatally flawed from the start? Hardly a magic cure for the credit cycle. The rest of Europe is losing patience. A better approach is risk reduction. And the “America First” challenge. How China is catching up fast. Look to the futures markets. By Philip K. Verleger, Jr.
Do deficits matter? At least not for now. Copyright © 2019 by The International Economy Publications, Inc. All Rights Reserved.